Along with oil, antifreeze, transmission fluid, brake fluid, and fuel, modern diesel engines also need DEF to run properly. All North American Sprinters built after 2010 have DEF tanks. DEF helps with emissions control and the computer in your van will stop you from driving if it detects an empty DEF tank. But don’t panic if the DEF light on your dash comes on. You’ve got plenty of time to fill up. 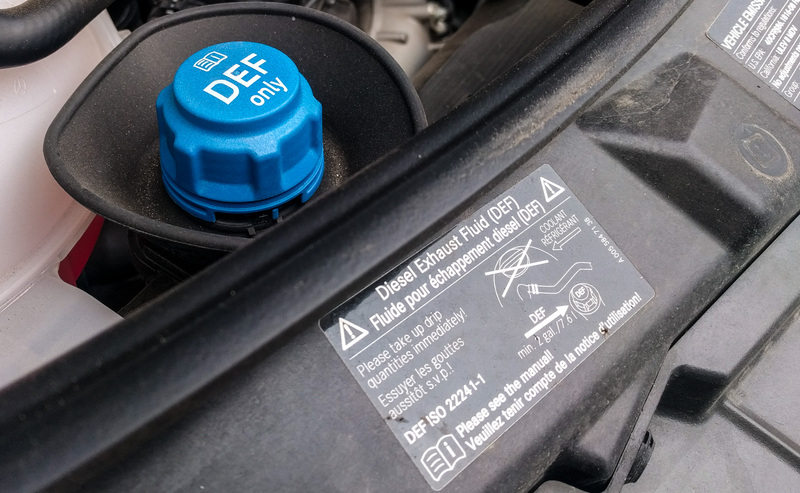 So, what is DEF, why does your engine need it, and what’s the best way to fill the DEF tank? 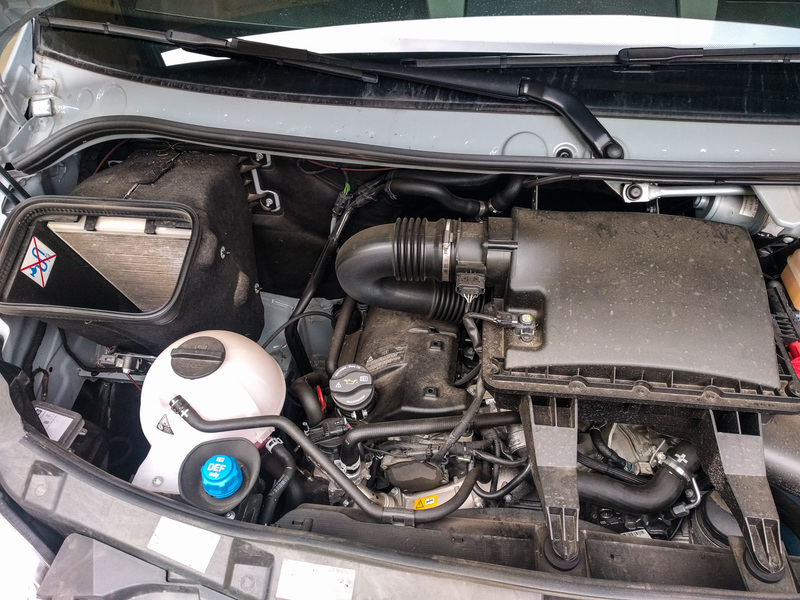 Diesel Exhaust Fluid is a mixture of urea and water. Basically the same ingredients as urine. But don’t try peeing into the DEF tank to refill it – DEF is a specific proportion (32.5% urea, 67.5% water) and pretty pure. The impurities in your pee would mess up the SCR catalyst. Urea is nasty stuff – it’s corrosive and will eat through copper cables. In the exhaust system, its job is to convert nitrogen oxides (NOx) into water and nitrogen. The DEF is injected into the exhaust pipe just before the selective catalytic converter (SCR system). The exhaust has already been treated several different ways by this point. The DEF breaks down into ammonia in the hot exhaust gasses. The SCR helps this ammonia to react with nitrogen oxides. This reaction produces water vapor and nitrogen – neither of which cause pollution issues. How much DEF you use will depend on your driving style, but it’s only a tiny proportion of the amount of diesel you use. Some 2016+ vans have a DEF level indicator in the dash display (if you have the high line display with the steering wheel buttons). Everyone else pretty much as to guess how full their DEF tank is, or just wait for the dash display to light up. When there’s 1.5 gallons of DEF left, the vehicle will warn you to refill. 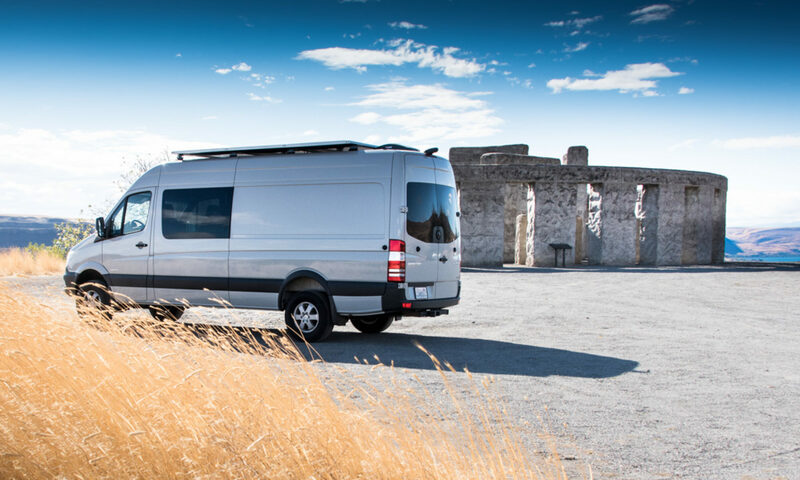 If you have the high line LCD display, it will tell you to “Check Additive” (not a useful message) or “Check Diesel Exhaust Fluid” on newer vans. Ignoring the warning isn’t a good idea. When the DEF level gets to 0.8 gallons, the check engine light will also come on, and the van will tell you that you only have a certain number of starts left. After that, it will go into limp home mode and you won’t be able to drive at speeds above 5 miles per hour. The sensor in the DEF tank seems to still be an engineering work-in-progress. Several people on the Sprinter forum have reported that theirs has failed, even though they’ve filled the tank up. The NOx sensor in the exhaust system also fails occasionally, and that can lead to DEF warnings too. The dash light won’t go out as soon as you add more DEF. It will take a couple of starts for the van’s computer and sensors to update. Do NOT add DEF to your fuel tank. The DEF tank fill is under the hood. The blue cap has a small funnel area around it to catch any stray DEF. DEF tank filler has a protective collector around it. You don’t want DEF loose in the engine compartment. The tank itself is under the sliding door step in 2010-2013 vans. 2014+ vehicles mainly moved to a smaller tank in front of the right front wheel. After filling up, put the cap back on and then rinse around the whole area with water to dilute any DEF that might have spilled. DEF is corrosive and can damage other components in your engine area. Top off or drain and fill? There’s a big argument about whether you should keep the DEF tank topped off (so the sensor doesn’t get exposed and damaged) or whether you should run the tank down and then replace it all at once (so the DEF is new and doesn’t crystallize). We just wait for the dash display to tell us when it’s time to add more, and fill up with 2.5 gallons. Even after the display comes on, you have around 500 miles before you will actually run out of fluid, so there’s no panic and no need to carry this stuff around with you. Most auto stores and even some gas stations carry it. Check the expiration date before you buy. Fresher really is better with DEF. Mercedes sells a DEF product called AdBlue. It’s the same Diesel Exhaust Fluid as everyone else sells. In other words, you can get it much cheaper elsewhere. Cheapest: Fill up from a truck stop DEF dispenser. Just like fuel pumps, truck stops have DEF pumps too. It’ll be much cheaper per gallon. It’ll also probably be fresher than any you find in a carton. Cheaper cartons than Mercedes: We have used several different brands. Prestone’s 2.5 gallon packs work well, although their pouring spout is super-cheap. You can buy the 2.5 gallon containers for less than the price of 1/2 gallon of Mercedes’ AdBlue. We’ve also used Peak BlueDEF which comes in a cardboard pack. You don’t take it out of the pack – just expose the cap and screw the spout on. Harder to pour, but it works just fine.